Identification of difficult species is one of the pleasures and frustrations of birdwatching. The majority of records submitted to SBRC are not accepted due to a failure to rule out possible confusion species. These are some of the most tricky Seychelles species to separate. Figures given for the numbers of records accepted by SBRC are correct as at May 2012.
idae , Squacco Heron Ardeola ralloides and Indian Pond Heron Ardeola grayii. Seychelles is the only country in the world where these three species have all been recorded, so it is important to consider all three in any Ardeola sighting in Seychelles. Madagascar Pond Heron breeds at Aldabra but has also been recorded as a vagrant on Aride, North and Bird, while 2 records have been accepted as "Ardeola sp. 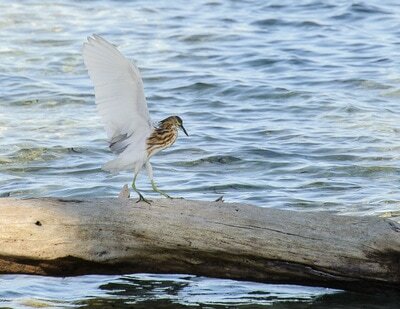 probably Madagascar Pond Heron". 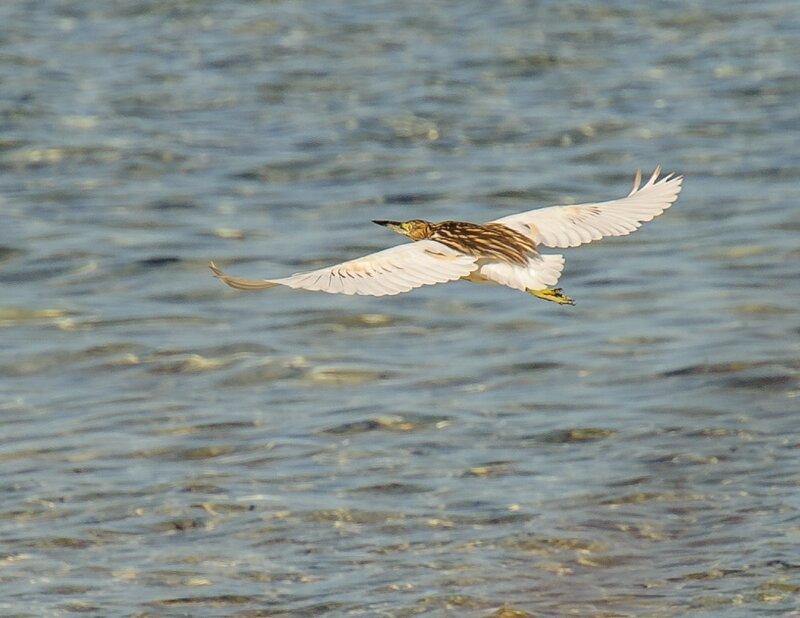 Indian Pond Heron has been recorded 7 times and has been recorded nowhere else in the African region (twice at Mahe, twice at Denis and once at each of Bird, Frégate and Mahe. 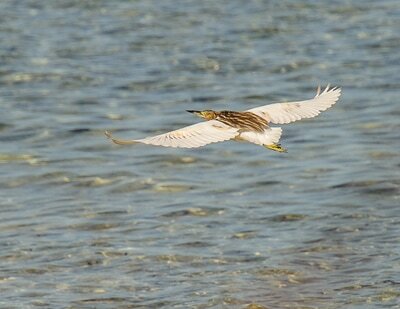 Squacco Heron has been recorded 5 times (twice at Mahe and once at each of Aldabra, Mahe and Praslin). SBRC has also accepted 8 records as Ardeola sp. 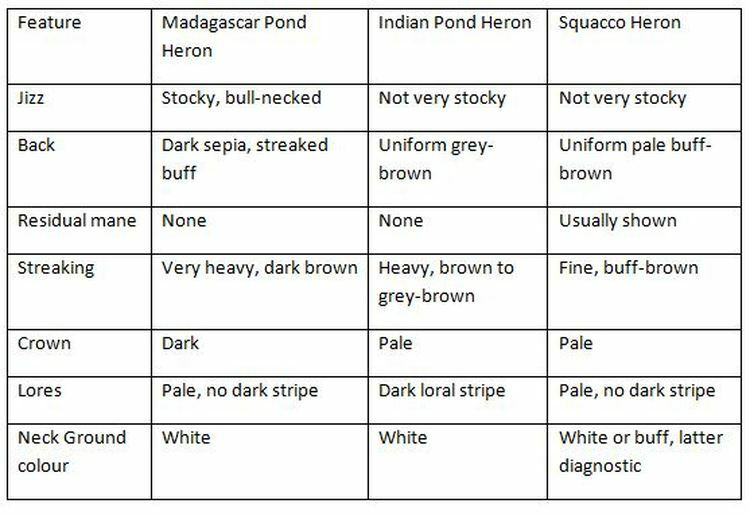 Key features to separate the three species in non-breeding plumage are given in the table below. 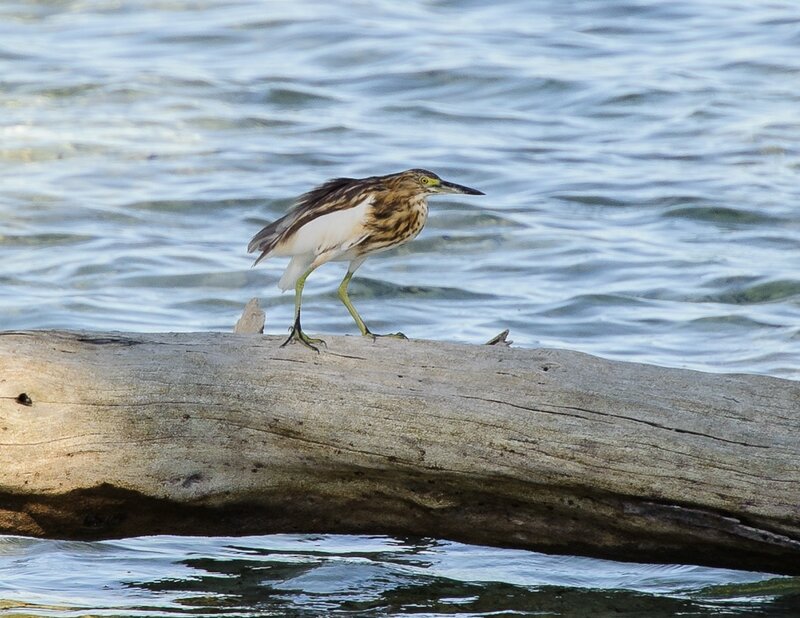 Note in the left photo the very heavy dark brown streaking and dark eyestripe of Madagascar Pond Heron unlike the other two Ardeola species recorded in Seychelles. 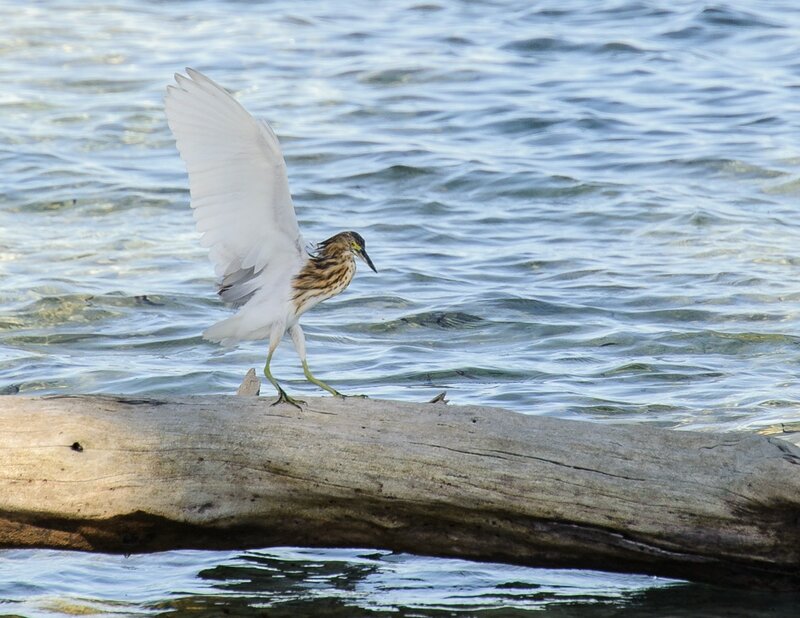 In the photo in the centre, the white wings are typical of all three species but only Madagascar Pond Heron shows a dark brown streaked back, the other two species being unstreaked and different in colour tone. Four species of pratincole have been recorded in Seychelles, Collared Pratincole Glareola pratincola (12 records), Oriental Pratincole Glareola maldivarum (15 records), Black-winged Pratincole Glareola nordmanni (11 records) and Madagascar Pratincole Glareola ocularis (3 records). Black-winged Pratincole is relatively easy to separate especially given good views in flight, being the only species with an all-dark underwing. Madagascar Pratincole is also fairly dicstinctive with its unique head pattern. Oriental and Collared are more difficult and SBRC has accepted 30 records as Pratincole sp.